When Margo Roby asked us to write a poem about an idyllic place, it didn’t take me long to come up with an idea. I clearly pictured a place that was very special to me. I ‘painted’ a short idyll, and wanted to complete it with a photograph, but realized it would take me forever to find it hidden somewhere in the house in the depths of a still unpacked box. In my mind I saw a dirt road, more of a narrow pathway really, cutting through fields of yellow rye. The road led to a dark stretch of forest. And then there was the sky. The enormous semispherical sky, overpowering, and consuming everything else. As I traveled that idyllic place of mine, I was reminded of other, very similar, places, that my mind kept safe for me without my realizing it. Pine forests, dirt roads, rolling waves of rye fields, the endless skies…lovingly and painstakingly painted. I remembered the works of an artist. In the blessed days of the all knowing ignorance of youth I proclaimed that I did not like his art. Now I owe him my allegiance. That’s my first association with Shishkin – candy. The next is photography. It is not surprising that my thought took me from a photograph to Shishkin’s paintings. They do possess an impressive photographic quality. That was the precise reason for my earlier ‘dislike.’ Although I’m still drawn to other styles, I’m a lot less arrogant now. My more mature, older self does like Shishkin. I walk through his paintings, breathing them in. I marvel at their incredible detail, and I see big things I never noticed before. Now that I’m so far away from the subject of his work, I appreciate both – the subject and the work – so much more. So, I chose one of Shishkin’s paintings, placed my poem-idyll below the image, and posted. Above - the endless sky. I was surprised and touched by the resonance that short post received. People loved the painting. (My humble caption got some favorable comments, too.) A little while later I was in for another surprise, when Margo Roby, in the spirit of her newly found love for Shishkin, picked his painting as one of the visual prompts for her Tuesday Tryouts. What a trove of information. Hubby has some Russian heritage (among others). I don't yet know how to book mark on google so I'm going to copy and paste the links into a folder so I can get to them again. 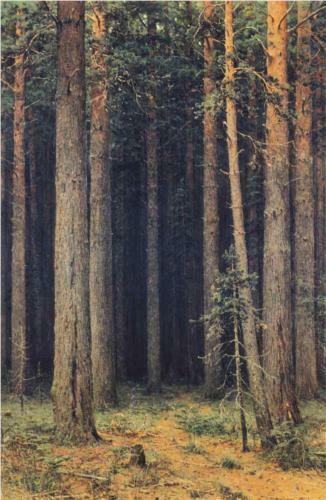 I can say that I think Shishkin's paintings have a fairy tale like quality to them. If they haven't been used for Grimms' brothers tales they should be! I'm so glad you found this interesting. Thank you very much for your response, Jules!